Alpentile Glass Tile Swimming Pools: New From Alpentile - Handcrafted Glass Mosaic Murals! New From Alpentile - Handcrafted Glass Mosaic Murals! Exciting developments over here in the Alpentile Creative Suite....We just completed our first custom glass mosaic mural. 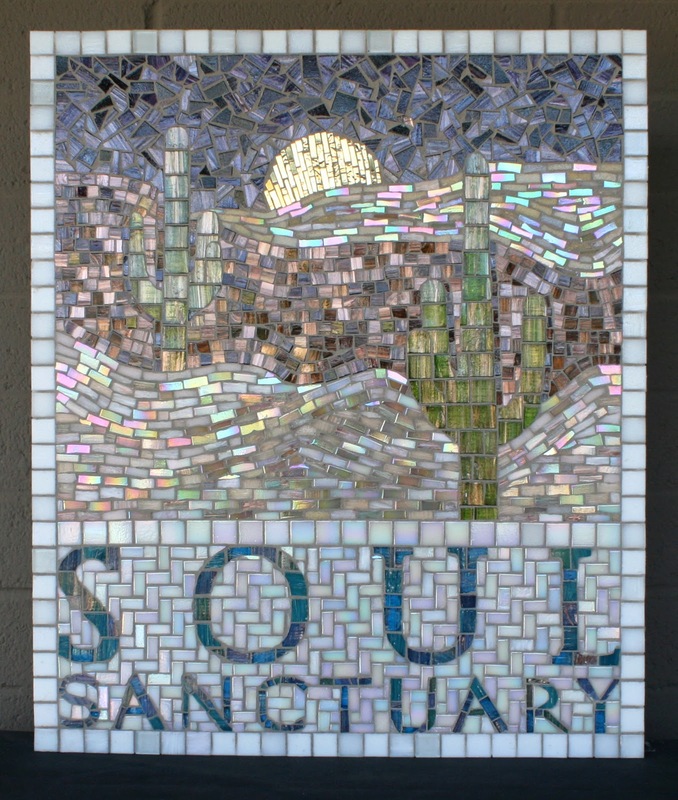 We'll be presenting this to The Soul Sanctuary at their next fundraising event, which is right around the corner: December 12, 12pm, at The Sanctuary Resort and Spa in Paradise Valley, AZ. It was a great way to get our feet wet in the custom mosaic arena - This piece measures 18" x 24", and took approximately 52 hours from start to finish. It would be considered a tedious task to many, but both Luke and I found the process to be a calming and enjoyable labor of love! My creative spirit has been on reserve for some time, and it felt absolutely amazing to get back in the artistic groove and be fully immersed in this project. I'm so thankful to Josette and the Soul Sanctuary for being the inspiration that influenced me to make this piece. If you are interested in attending the Soul Sanctuary fundraiser this December, please contact me! This mural will be presented at the event. We will also be auctioning off a beautifully handcrafted original quilt, made by Coleen Swettman and quilted by The Peach Pie Quilting Studio out of San Diego California!